We used to reserve our floor cleaning for very special occasions—like limbo night or the queen’s visit, but this non-toxic and biodegradable no-wax wood floor cleaner turns a chore into an almond-scented delight. 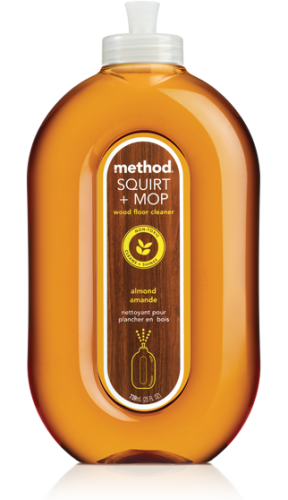 Just squirt, mop and bask in the glow of a gleaming clean, formulated for sealed hardwood and laminate floors. squirt the non-toxic, biodegradable floor cleaner directly onto the floor (think: laminate flooring, tile and sealed stone). our ergonomically designed shower-nozzle spray helps avoid puddling, but remember, a little goes a long way. so, use just enough to wet the surface. Love the smell, love the result. Cleans my wooden floors with such ease. Highly recommend the Method range. My house smells so clean and fresh instead of bleach. 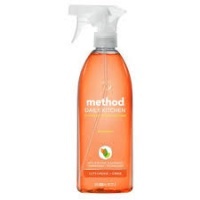 I never found a wooden floor cleaner that smelt so nice & leaves no residue or stickiness, this is amazing! Love this product! My floors are sparkling & my house smells divine. There is a lovely subtle smell to this product as I often find product smells overwhelming. It soaked into the wood well and did a good job on my floors. I would buy this product again. Love what it does for my wooden floors, leaves them shiny and clean. Not mad about the scent, reminds me a bit too much of baby wipes/powder. This cleaner smells amazing and leaves a lovely shine. Brilliant for doing a quick mop with the same results as the traditional mop and bucket route.